Double Dragon II: The Revenge (ダブルドラゴンII ザ・リベンジ Daburu Doragon II: Za Ribenji?) 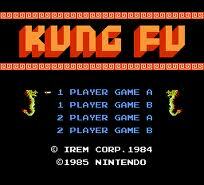 is a side-scrolling beat 'em up produced by Technōs Japan originally released as a coin-operated arcade game in 1988. 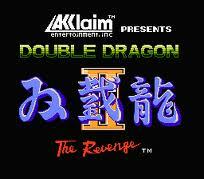 It is the sequel to Double Dragon, released during the previous year. A home version for the Nintendo Entertainment System was released in 1989 which differs drastically from the original arcade game. Other home versions were also released for the Sega Mega Drive/Genesis and PC Engine. Kart Fighter (Chinese: 瑪莉快打; pinyin: Mǎ lì kuài dǎ, lit. 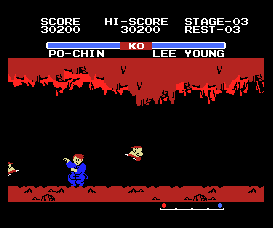 "Mario Fighter") is an unlicensed 2D fighting game produced for the Nintendo Famicom. 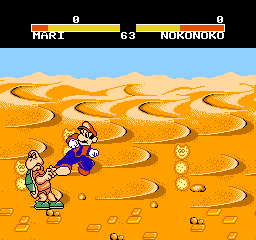 The game features unauthorized appearances by Nintendo's mascot Mario and the rest of the cast of Super Mario Kart in a port of Street Fighter II. Since its release, Kart Fighter has received some media attention, including mostly positive reviews, in part because of its perceived similarity to the later Super Smash Bros. series. M.U.S.C.L.E., (Millions of Unusual Small Creatures Lurking Everywhere), was a toyline of 2-inch tall monochromatic PVC gum wrestling figures produced in the United States from 1985 to 1988. The story involved intergalactic wrestlers fighting for supremacy of the universe. The toy line itself was straight forward and collectors continue to make the line a viable hobby. 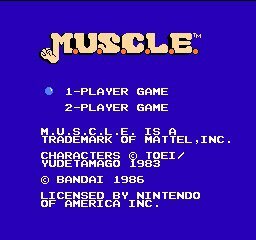 The US line included 236 official figures, a boardgame, a NES game entitled M.U.S.C.L.E., a championship belt figure holder, and a wrestling ring playset. The figures were distributed in clear, blister-packed random 4-packs, semiopaque garbage can 10-packs, and boxed fixed sculpt 28 packs. For a short time, the figures were also distributed as a bonus in Nestlé Quik (now known as Nesquik) cans. Punch-Out!! (パンチアウト! !, Panchi-Auto!!) is a series of boxing video games created by Nintendo's general manager Genyo Takeda, and his partner Makoto Wada. It started in the arcades simply as Punch-Out! !, which was followed by a sequel Super Punch-Out!!. It has since spanned home consoles, including the Famicom and NES Punch-Out!! / Mike Tyson's Punch-Out! !, an SNES and Super Famicom sequel Super Punch-Out! !, and a Wii sequel Punch-Out!!. 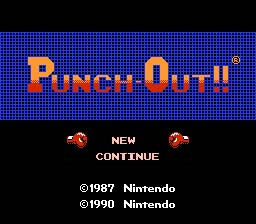 In November 2009, Platinum Club Nintendo members received a code to download Doc Louis's Punch-Out! !, which features a fight between series protagonist Little Mac and his mentor Doc Louis. The series also had a spin-off called Arm Wrestling. 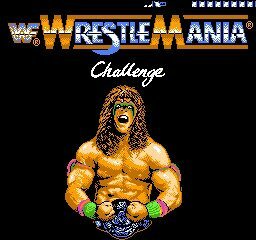 Arm Wrestling was released only in North American arcades, and was Nintendo's last arcade game they independently developed and released. River City Ransom, originally released as Downtown Nekketsu Monogatari (ダウンタウン熱血物語, Dauntaun Nekketsu Monogatari, lit. 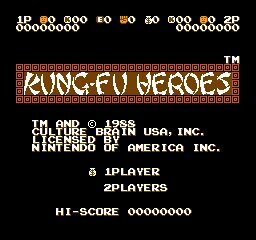 "Downtown Hot-Blooded Story") or Downtown Nekketsu Story in Japan and later as Street Gangs in PAL regions, is an open world action role-playing beat 'em up video game for the Family Computer/NES. It was developed by Technōs Japan and originally released in Japan on April 25, 1989. It is the third game in Technos' Kunio-kun series released for the console, preceded by Renegade and Super Dodge Ball. 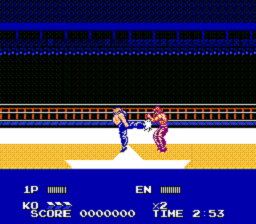 Like its predecessors, River City Ransom underwent great changes in its storyline and graphical presentation during its localization in order to make the game more palatable in the Western market. It was one of the first console games published by North American subsidiary American Technos. Remakes of the game have been released for the Sharp X68000, PC-Engine Super CD-ROM², and Game Boy Advance (GBA). 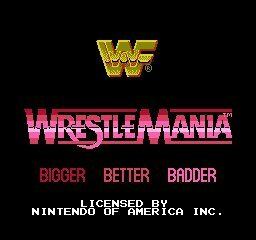 The NES version was re-released on the Wii's Virtual Console in 2007. It was also released on the 3DS Virtual Console in the PAL Regions in July 25, 2013 and in North America in November 14, 2013. Not to be confused with the Hartung Game Master game of the same name. 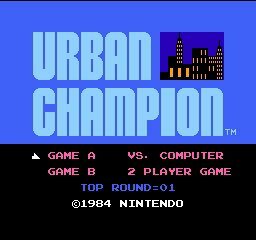 Urban Champion (アーバンチャンピオン?) is a 2-player fighting game produced by Nintendo in 1984. It was inspired by the 1984 Game & Watch title, Boxing (also known as Punch-Out!!). 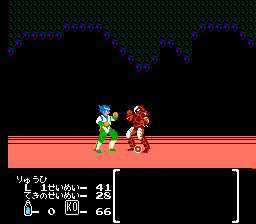 It is also Nintendo's first 2D fighting game, followed by the 1993 Joy Mech Fight, released exclusively in Japan for the same platform.